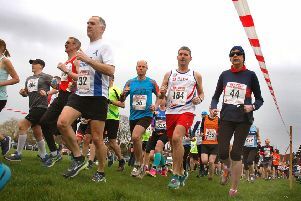 Organised by Bowline Climbing Club, the fell race is in its 33rd year and covers approximately 14 miles and 1,200ft of ascent, run through open countryside and footpaths, taking in Bradgate, Broombrigs and Beacon Hill Country Parks. First back for Stilton in 97th place overall was Ian Drage in 1hr 56min 41secs, three minutes ahead of clubmate Natalie Teece, who was 117th overall in 1.59.40. Then came Andy Nicholls (2hr 04min 40secs) in 148th, Michael Cooke (205th – 2.13.47), Tam Nicol (220th – 2.18.38), Liz Taylor (226th – 2.29.27), and Sarah Lawrence (267th – 2.29.29).